African penguins rely on warm, sunny beaches to nest. But they spend most of their lives swimming in the cold, nutrient-rich waters flowing up from Antarctica. African penguins eat sardines by the dozens. They may also snack on squid, anchovies, and other small animals, but their success relates directly to their ability to find fatty, nourishing sardines. African penguins live in the cold ocean off the southern coast of Africa. They move to the beach mostly to mate, nest, raise young, and molt. They may swim 30 miles off the coast and spend days at a time gorging on dense schools of their favorite fish. 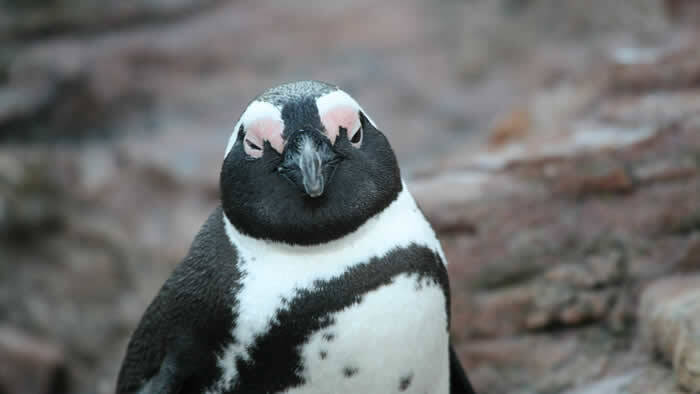 African penguins, like most other penguin species, are endangered in the wild. Oil spills, historical hunting, and destruction of their habitat have killed 80% of the population in the last 50 years. Right now, the greatest source of their troubles comes from a catastrophic drop in the number of sardines as a result of overfishing and changing ocean climate. Penguins eat fish equaling almost 15% of their body weight each day. For a 150 pound adult human, that would be like eating 22.5 pounds a day. Penguins are birds, feathers and all. Those feathers insulate them against frigid water. Their specialized wings help them fly efficiently in the ocean. 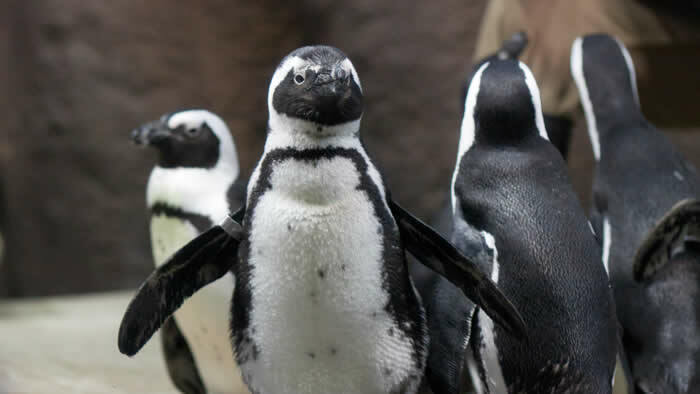 Moving between the cold ocean depths and the hot beach, African penguins may experience a temperature change of more than 70 degrees F.
Penguins swim through the water at up to 15 miles per hour— faster than many fish can swim! The African penguin population has declined dramatically since the beginning of the 20th century: in the last 50 years, the population has dropped 80 percent. There were approximately 1.5 million African penguins at the beginning of the 20th century; today that number has decreased to ~25,000 pairs of birds. The species is now listed as “Endangered” under the U.S. Endangered Species Act and the International Union for Conservation of Nature (IUCN) Red List of Threatened Species. There have been a number of factors contributing to the African penguins’ decline. Historically, their breeding colonies were raided for their eggs and guano. The guano was harvested for use as fertilizer. Today these threats have largely been eliminated. Currently, the two most pertinent threats to the survival of the African penguin are the risk of oil pollution and competition with commercial fisheries for the pelagic fish. Overall, the lack of adequate food resources is a problem for the African penguin. Climate change may be responsible for the shift in their prey to areas outside of the penguins’ normal feeding range. Excessive heat and no protection from the sun also takes its toll on young penguins. 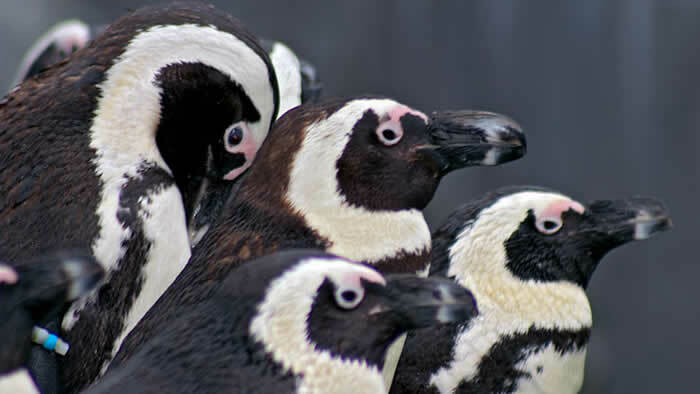 A major oil spill in 2000 threatened as much as 40% of the African penguin population. Predation by cape fur seals and sharks on penguins, as well as predation of the eggs and chicks by avian predators pose a danger to the survival of the African penguin. The introduction of domestic animals, such as cats, poses a threat to chicks and eggs on the mainland nest sites. Habitat loss due to human use is also a continuing threat. Conservation groups have become very effective in rescuing “oiled penguins” and deserted penguin chicks and returning them to the wild.